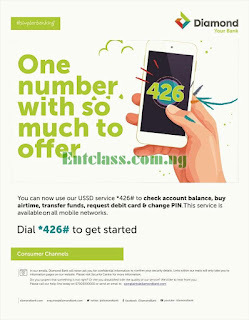 Diamond Bank Plc has officially announced a new USSD short code to carry out transactions offline without internet connection. The new USSD short code is being launched to reduce the queue on the ATM post and help you carry out simple transactions right on your bed instead of visiting the banking hall. Before now, Diamond bank official Android app has been always there for simple and easy transactions like pay for bills, transfer money, buy airtime and data for yourself or a friend but all these requires internet connection before carrying out any transactions. The new Diamond bank ussd short code is *426#. The self-service platform is designed to help you carry out some important transactions from the comfort of your home without internet connection. Below is what you can do with the new Diamond bank short code. N.B: The short code works for all Diamond bank customers. You must dial the code on the sim used for opening the account (the phone number that is linked with your Diamond bank account). It doesn't require any internet connection before it can work as it's a total offline banking platform making it a better alternative to the mobile app that requires internet connection before it can work or perform any transactions. After that, enter your Account Number and send. Now, you will be asked to create a new 4-digit Mobile pin (Mpin), so choose a pin you can remember easily whenever you want to transact with the USSD code. That’s all. After that, you'll get a message telling you Registration successful. Have you activated yours? Please share this post with friends. Nice bank, good development from diamond Bank. These mofoz had refused to launch this service because of their yellow account, well it's good they've finally launched it but a little late cause many have already ported to Gtb and other banks. Wow! 3 numbers with so many works encrusted in it..